If you are looking for the perfect coastal escape on the beach and you want to experience the most incredible views on the coast then “Change of Pace is your home away from home”. Change of Pace is a 3400 square feet 6 bedroom/5 bath home featuring a 2nd remote master suite with sitting area located upstairs for privacy. This is the perfect location for a family reunion, large get-togethers, or wedding. 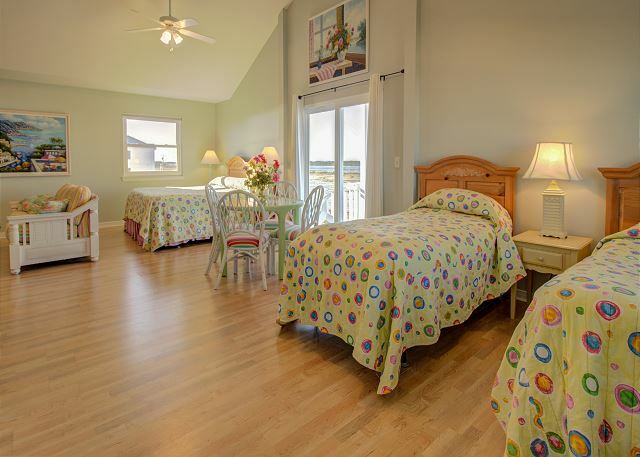 Nothing says beach house more then the huge open lower deck overlooking the Gulf for your family and guest’s outdoor activities. There is also a screen porch to sit and watch the waves crashing on the beach. If you need an afternoon siesta there is a hammock on the porch for relaxing or capturing a few surreal moments while gazing at the Emerald Coast. The kitchen and dining area seats 18-20 for a large get together. A crisp white kitchen with hues of blue & yellow accents makes it both welcoming and a warm atmosphere for your quality family time. Fully equipped, large cook stream kitchen has everything including an under the counter icemaker for lemonade or margaritas. 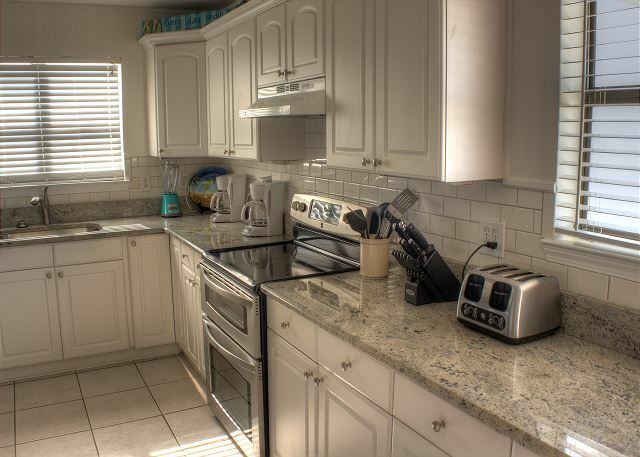 There are 2 sinks and lots of work area with a large island that seats 8 people. The large living room has a bonus room with 2 sofas and a large 55” high-def television. There is an additional card table for fun and games. 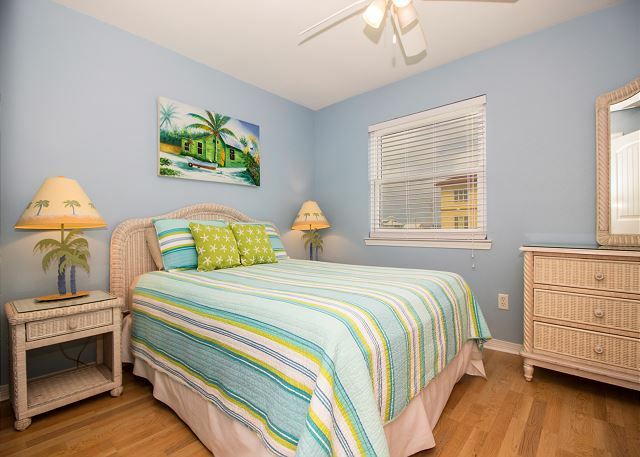 After a day of fun in the sun you can retire to one of the 6 sea-color pastel bedrooms. 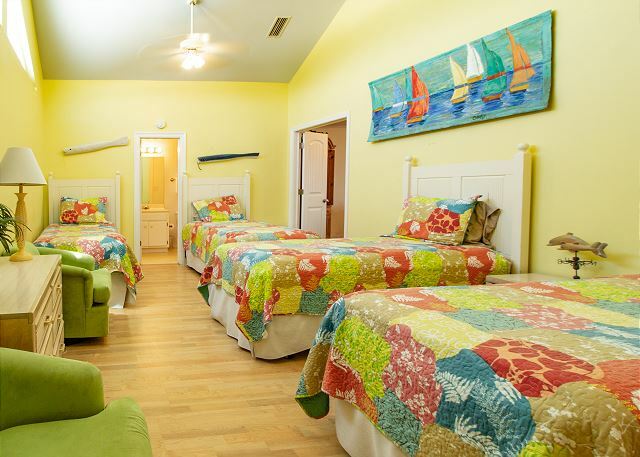 Accommodations to sleep 18 include 3 king size beds, 2 queen size beds, 6 twin or single beds, 1 sleep sofa or futon. 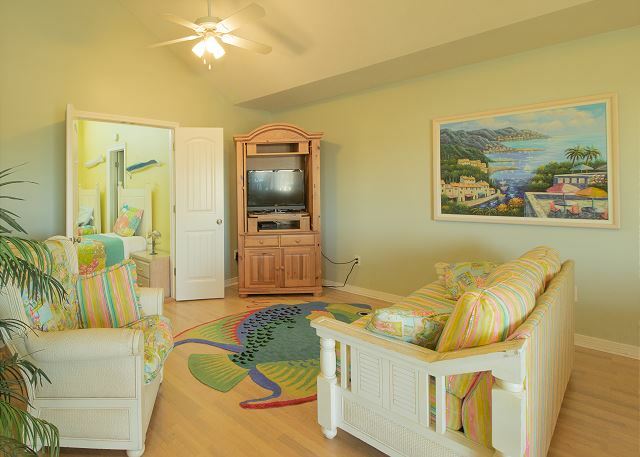 Each bedroom has a high def television with a 47” television in the Master bedroom. 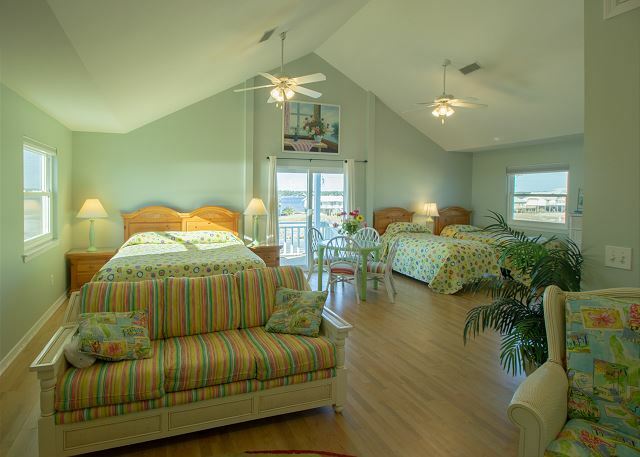 Two bedrooms have private balconies for that last late night thrilling view before slipping off into dreamland. With soft white sand and emerald water, Gulf Shores is Alabama’s original beach town. Its lazy days by the water and pleasure-filled nights on the town have been attracting visitors for decades. This charming coastal town, with its something for everyone mentality, has become a favorite spot for families gathering each year. From a relaxing round of golf, to the sounds of laughter at amusement parks, to tantalizing tastes at restaurants you will be in paradise from the time you arrive until you leave. Our stay in Change of Pace was great. We had four generations in the house, ranging from four months to eighty one. Lots of room for togetherness and also space for privacy when wanted. Excellent! 11 of us stayed here couple years ago and had to go back to this same place. Very clean and accessible. Love the place and we will be back!! Change of Pace has a floor plan that is perfect for multiple family units. Having your own bathroom with large groups makes it work. 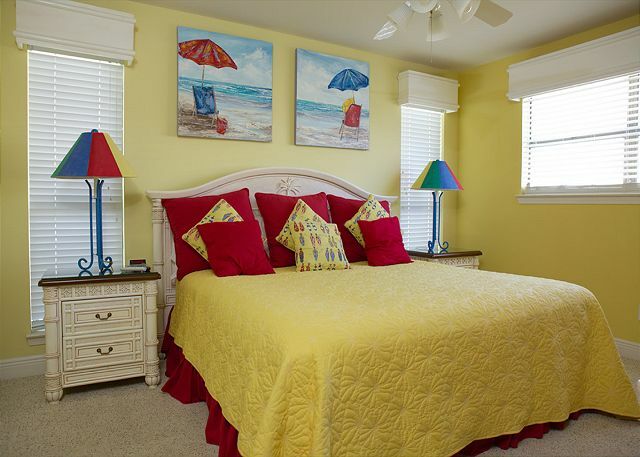 We loved each bedroom with the variety of art and colors and they were divided up perfectly. Then the kitchen was fun to cook in and the large table made dinners a special thing with little work. The beach is right outside the door and private. Neighbors each keep to their area in front of their house. We got spoiled on parts with this home. The water changed each day with the tide which made it very interesting. We went from some seaweed, to clearer, to jellyfish, to totally clear. Fun waves to totally calm, and always dolphins going by. Saw an otter, crab, stingray, and shells. Caught ocean catfish, and two other kinds of fish. Loved the freedom the space gave for everyone to do their thing--yoga, fish, board, build sandcastles, fly kites, walk for sunsets, etc. It was a treat to be here. Thought we would be driving far to everything else, but only 5 min to 15 min to places we went for pizza, groceries, etc. Only place I cleaned on my own was to sweep and hose off the sand at the outdoor shower area. I liked the area clear for walking and sitting. As the host and hostess we even got to relax since the house provides naturally to all ages. We have been spending a week on the Gulf for over fifty years; this was our first trip to Gulf Shores. It was an easy road trip, about 6 hours. 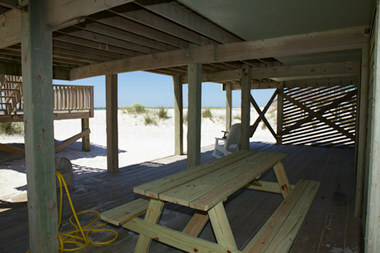 The beach house was great, room for all of us to be together yet have private space too. We have booked the same property for next year, the hightest compliment we can give. Metri was wonderful, responsive to our every need, very helpful. We look forward to returning in 2016. We stay in Gulf Shores every year. This was our first stay at the Change of Pace beach house. We had a rather large group, so it was really nice having enough space to spread out. The location is great, close enough to town but also far enough away. The property manager is a pleasure to work with, hes already helping us plan our trip for next year. My wife and I wanted a small beach wedding with only close family to attend. We ended up having 13 total people stay in the house. the house was absolutely perfect for our purposes!!! Beautiful view of the ocean. There was a large outdoor deck with plenty of lounge chairs. Large screened in patio also with plenty of chairs and a hammock. Large living room and super kitchen all with a wide open view of the beach. The master bedroom had a huge bathroom and the other rooms were easily large enough for all our guests to move around. This was the perfect house for us. Everyone was thrilled at their accommodations and amenities. Everything worked and the key lime pie waiting for us from Demetrious was delicious!!! Return trips to Gulf Shores are definitely in our future and any property Demetrious is associated with will be considered!! Wonderful trip all the way around!! Our stay was absolutely wonderful. We stayed on the beach 6 of our 7 days. One day we drove into Pensecola to tour the USS Alabama. Highly recommend it, it gave us a whole new respect for what those men had to endure. Change of Pace was everything the pictures showed. Bright and cheerful, clean, never felt crowded (12 family members), plenty of space for us. Accommodations we're perfect with the exception of the bathrooms. They needed a little TLC. Metri was like a dear friend the first time we met him, very nice. The family left a few items and Metri went out of his way to mail them back to St. Louis. We don't get the opportunity to vacation often but would certainly return to Change of Pace. I have been down to Gulf Shores for the last 4 years and stayed in 4 different places but this place by far is the Best!!! Very spacious . I will definitely stay In this place again.. This was our 8th Christmas at Change of Pace---wow! so spiffy with the new stainless steel appliances including a French door refrigerator, granite counter tops, and laminate wood floors. I should have planned jazzier meals. The kitchen is a joy to cook in and so well equipped. I love it that the dining table can seat all 13 of us. The other important plus here is there are great mattresses on the beds. The beach was beautifully restored and full of shells...such fun to go down the deck stairs and step right into the sand or sit in the swing (my favorite spot)and watch my grandkids play in the sand. The weather did not cooperate--35-45degrees so our hoodies were the attire of every day. The kids played in the water until they turned blue. And we all played volley ball in the sand when we could, and used the Gulf Shores Rec Center frequently. It is a great place. This trip we proved that fun is in you and not in the situation. After the kids left, we hosted 20 people for a tailgate supper and to watch the Alabama/Notre easy to do in this house. Metri was always ready to help---checking to see if we needed anything. We will certainly be back to "our beach house" for our ninth Christmas here. Thank you everyone.